Don't let the suave pose fool you, this tomcat is a nervous nelly who will flee in (un-explainable) terror at any moment. When we first moved into our home, he stayed hidden for three days --inside the basement walls. On a side note, I'm REALLY happy with this painting. Awesome color scheme, and love the composition! Great job! This a great painting Diane! 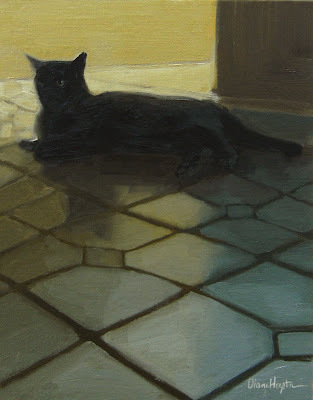 The lines of the tiles lead you to the cat and the back lit glow really sets off his attitude. This painting just shows how much you deserve the Arte y Pico award that I have picked you for. See my blog. Special thanks, t.ford: You are a MASTER of broken glass and sinuous satin! Love your new painting. Robin, oh my gosh, too cool! Thanks very much!! !